The Department of Health & Senior Services has posted the draft rules to implement Amendment 2 - the Medical Marijuana Program in Missouri. Following is a link to the DHSS website that will give you access to the draft rules as well as a link to a suggestion (response) form. The Missouri Pharmacy Association continues to get calls from Missouri Pharmacists in regard to CBD and hemp products. We have been working with BNDD to get a clarifying statement that we can send to pharmacists. Please see the Guidance Document that we received from Mike Boeger at BNDD to try to give you some guidance as to what is permitted vs not permitted in Missouri. Pharmacists are able to enter Medication Therapy Service Agreements / Collaborative Practice Agreements with physicians, which allows you to perform more clinical services for your patients. Through these agreements, you have been able to provide your community with more services. House Bill 725 will further this, by allowing you to prescribe tobacco cessation products to your patients and aid them in their fight to quit smoking. 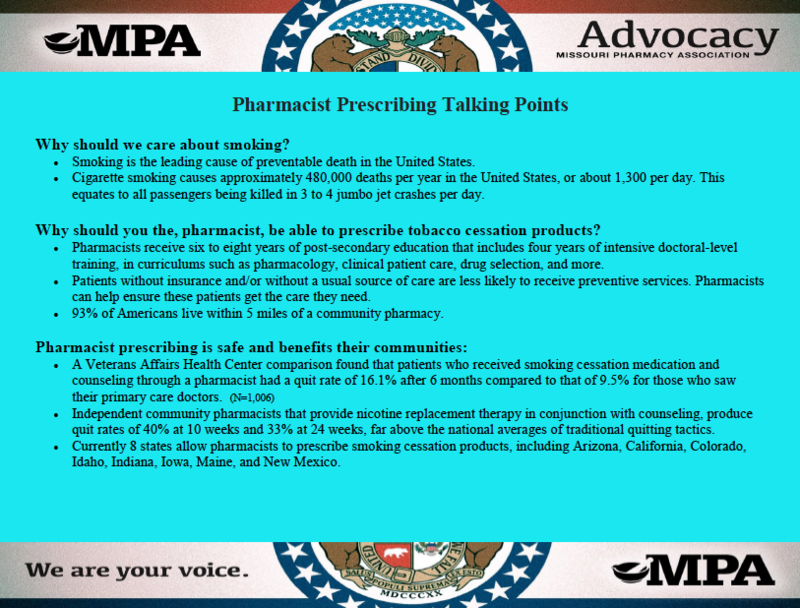 Click here to find the members on the committee, and if they’re your representative use the attached talking points and educate them on why your profession is well equipped to provide more clinical services, such as tobacco cessation counseling, and ask them to support HB 725.